Contributed by | Lantek Systems, Inc.
Lantek Sheet Metal Solutions pioneered Industry 4.0 solutions for the Sheet Metal Fabrication Industry. Their solutions include CAD/CAM Nesting, MES, ERP and they specialize in integrating software for Smart Factories. Lantek is globally headquartered in the Basque Country of Spain. Having over 30 years of experience, Lantek supports more than 20,000 customers in 100 countries. Lantek has offices in 14 countries. Lantek’s U.S. Headquarters is located in Mason, OH. Your company will be exhibiting at FABTECH, what is it that makes this an important event for your company? Lantek’s attendance at FABTECH is crucial because it brings together a tremendous number of fabricators under one roof to explore new solutions for their facilities. Not only can we interact with prospects, we also have the chance to meet with customers and partners while at the show. This year is particularly special for Lantek as our USA director, Adria Haines, will be presenting in three educational sessions on Industry 4.0 and the digital transformation of metal fabricators. Lantek will be releasing three new advanced manufacturing modules for metal fabricators while at FABTECH: Lantek Analytics, Metalshop, and iQuoting. All platforms are cloud-based to allow manufacturers access to pertinent information from anywhere they have an internet connection. 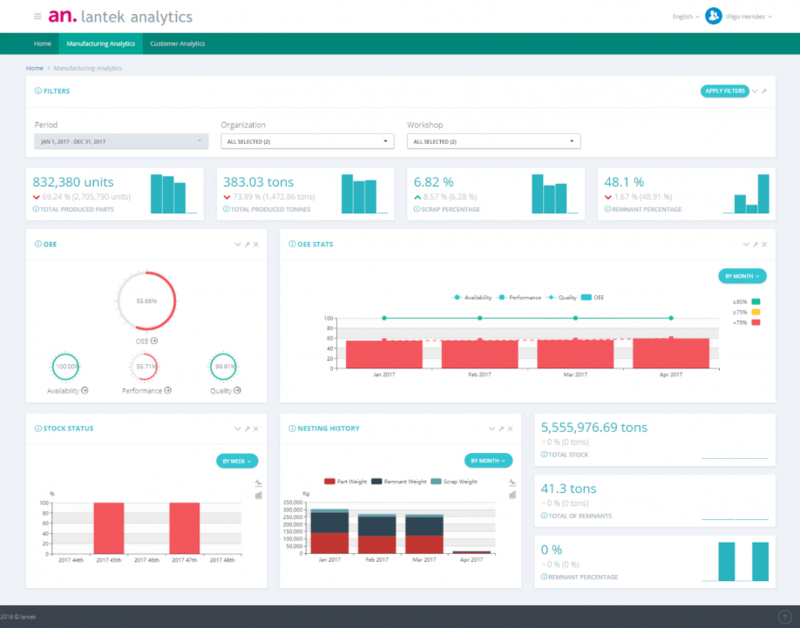 Lantek Analytics presents manufacturing and customer key performance indicators (KPIs) in a graphical interface that allows quick and accurate decision making. Manufacturing Analytics offers KPIs such as equipment availability, OEE, parts produced, percentage of good parts in a certain period, percentage of remnants over total raw material, stock status, and weight of parts produced. Customer Analytics offers KPIs such as accepted quote percentage, best customers by accepted quotes and margins, deviation from estimated costs, and history and location of quotes. Metalshop is an online supplier interface that enables customers to login, submit a request for quote, and place an order. Customers simply upload the part geometry and select material, quantity, delivery date, and delivery method. Lantek then performs a series of automated tasks to calculate cut time, material cost, stock levels, and the necessary margins. The iQuoting app allows non-technical sales teams to rapidly generate quotes for customers. Once a part is uploaded to the system it checks for anomalies in the data such as bad CAD data or zero part weight and notifies an engineer to intervene with the customer. This platform aims to reduce quote time and increase output for companies generating large volumes of quotes. FABTECH has many educational sessions, forums & demo’s, is your company involved in any of them this year? Lantek’s USA director, Adria Haines, will be presenting in three educational sessions while at FABTECH. The first session is F48: The Human and Digital Role In The Factory of the Future held on Wednesday, November 7, 8:00 a.m. to 10:00 a.m. in room B308. The focus of this session is to map attendees current location on their path to digital transformation while educating on creating proper milestones. The second session is F78: Smart Manufacturing Supply Chain & Real-World Case Studies held on Thursday, November 8, 8:00 a.m. to 10:00 a.m in room B308. The focus of this session will be how big data and analytical systems can help improve visibility across your supply chain, in turn leading to greater output and higher profits. The third session is F84: Tube & Pipe Cutting held on Thursday, November 8, 10:30 a.m. to 12:30 p.m. in room B407. The focus of this session will be how tube & pipe cutting machine tool builders collaborate with software suppliers to enhance the operator experience, streamline processes and create interoperable transparency throughout the manufacturing process. I will be most interested to see how machine tool builders are incorporating software solutions to create autonomous systems from the shop floor to the management office. 3D Printing, Additive Manufacturing is undertaking rapid advancements. These process hold huge benefits for many manufacturers, give us an idea on how your company and product is being utilized now in the advanced manufacturing. Lantek supplies software solutions to metal fabricators cutting and bending materials. We are not in 3D printing or additive manufacturing. Give us your thoughts on what the future holds for 3D Printing & Advanced Manufacturing. I am interested to see where 3D Metal printing goes in the next few years.